Hello Friends! I hope you have had a good start to your post-Thanksgiving week. We had a wonderful Thanksgiving at the Ivory Spring household. Miss Baby enjoyed being spoiled by her uncle, aunt and cousins! She can’t stop talking about them. I am ashamed of myself — I didn’t take any pictures of the food, tablesetting etc!!! Everything seemed to have happened way too fast with three kids 6 and under in the same house! Okay, let’s get to something related to the title of this post. 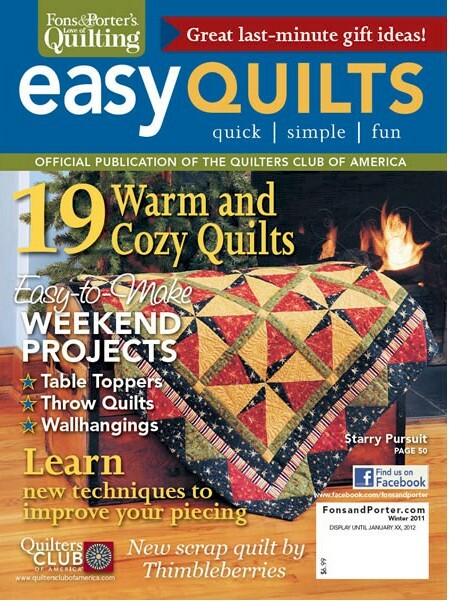 I had an “I have arrived” moment when I spotted my Starry Pursuit quilt on the cover of Fons & Porter‘s Easy Quilts (Winter 2011)! I'm so excited!! I bought ur cover quilt mag!!!!!! I'm soooo happy I found it!!! it also make me feel soooo proud!" It is also my first time experimenting with dark solid fabrics to highlight my quilting. I couldn’t be happier about the result. Quilting was done using Aurifil‘s Mako 50 Cotton threads over Hobbs Tuscany Silk batt. All the quilting was free-handed. That’s why you don’t see any identical feather plumes or pebble clusters. The fabrics are from Henry Glass‘ The Great I Am line, designed by Leanne Anderson of The Whole Country Caboodle. 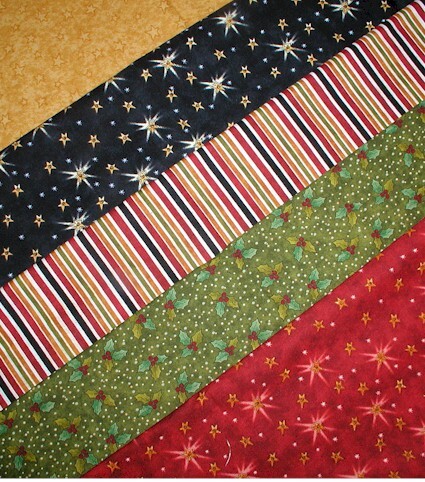 It is a Christmas fabric line, and as soon as I saw the fabrics, I knew the design had to be something related to stars! 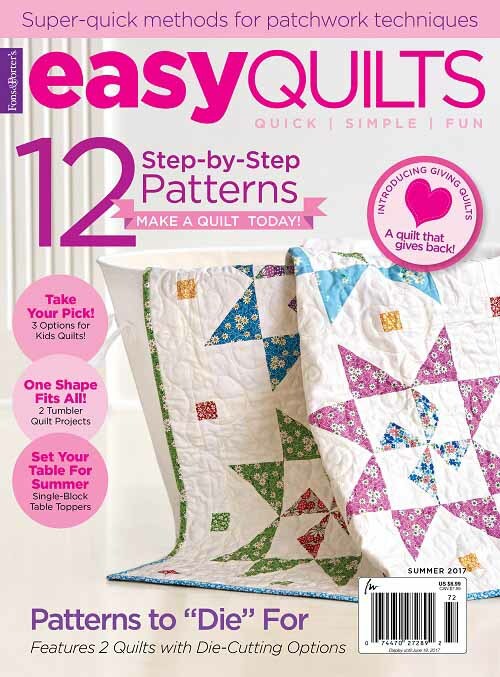 Click here for quilt kits to replicate the quilt, available from Fons and Porter. 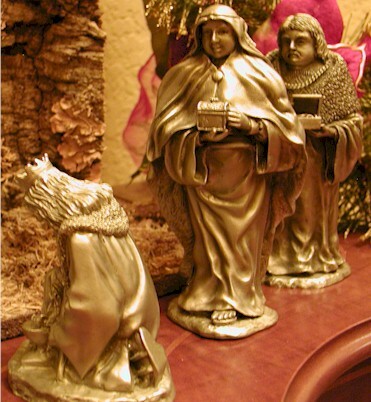 The story of The Three Wise Men captured my heart as a child when I first learned about Christmas, and has continued to fascinate me as an adult. These men were wise, yet they chose to still seek Him. Thanks for letting me share with you my favorite Christmas story via fabric pieces! It will definitely be one of my Christmas highlights that I will treasure for all my life. Blessings to you! p.s. I am also entering this quilt in SewCalGal’s Christmas Quilt Show. 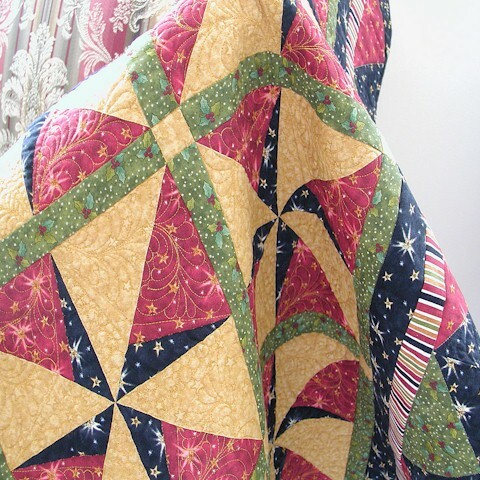 Click on the image below to see what other Christmas quilts bloggers have made! This entry was posted in Christmas, Quilt kit, Quilt Pattern, Quilting, Quilts & Projects: Published, Quilts: Pieced and tagged Feather quilting, Feather Quilting Motif, Fons and Porter Easy Quilts Winter 2011, Henry Glass The Great I Am Fabrics, Star Christmas Quilt, Starry Pursuit, Wendy Sheppard Designs. Bookmark the permalink. I saw that cover at the grocery store and snapped that magazine up so quickly. You do such beautiful work. The other night I was going through old magazines because I never throw one away. Every month there was a quilt by you. I was already impressed but Wow – you are a very busy lady and everything is so professional. Very pretty. I am glad to see the whole quilt in its entirety. Kudos. I bought the magazine the minute I saw it on the stand, recognized the cover quilt immediately. I would love to use this pattern for a QOV and the stars from the Great I Am would be perfect except this line is very difficult to find. I love all your feathers on this and that you changed your bobbin threads. Just beautiful as always! Beautiful quilt. Love the colours in it. Yippeee, you are famous ! It’s always lovely to see your work displayed in a lovely way. Your photos on the blog are always great, but it’s fun to see it in a larger setting. The Wise Men make me think of what faith it took to follow the Star so far from their home and so long. Happy Advent to you all and Miss Baby. Congratulations on the cover! It’s well deserved!!! Beautiful quilt! This is not a Magazine I have seen in New Zealand. What a wonderful feeling for you, to see your beautiful quilt on the cover, it is truly stunning. Indeed, what an honor to be on the cover of F&P. Love the title, couldn’t have had a better one! Always loved the Wise Men story, that they were wise enough to recognize the “veiled” threat, the reason why the king wanted them to come back and report to him what they had found. Also best of luck with the quilt show. Beautiful work – thank you for sharing. Congratulations, dear Wendy, this is a gorgeous quilt! I always get a thrill when I pick up a quilt magazine and see your name, I can just imagine how much that thrills YOU! Great job! Absolutely gorgeous! The quilting is amazing!!! It was definitely worth all the waits. It is a real “star” to be selected for the cover!!! Beautiful, Wendy. Gorgeous. I can see why it’s a cover quilt. So So beautiful. How exciting. Glad your holiday was great! Absolutely gorgeous. The quilting you did is outstanding. Love the name, love the quilt, Congratulations ! Love the name, and love the quilt. Fabulous fabrics, and your quilting is just stunning! Great inspiration for a beautiful quilt. Making cover is like winning an Oscar; you are a winner! I look forward to seeing you with more “Oscars”. Wow! Congratulations! It looks lovely! I enjoyed hearing the story behind the name. This really cleared this question up for me. I just wanted to thank you for this awesome read! This might just go totally against almost everything I have thought until this moment however, I am going to try it and I will let you know what happens. Really well written article! I am sure a lot of visitors are surprised by this news but I’d like to tell anyone seeing this blog that what is written here is absolutely true. Hey a BEAUTIFUL quilt and a great story…….Itoo remember being touched by this story of the THREE WISE KINGS………WHEN I WAS A KID and having a lovely illustrated book………..though I am not a Catholic……..but i dearly loved my book.Now I LIVE in Spain where we do celebrate the visiting of the threeWISE KINGS TO BABY CHRIST ON FIFTH OF JANUARY.IT IS CALLED NOCHE DE REYES.JAN.6 IS THE HOLIDAYWHEN THE KIDS WAKE UP TO SEE WHAT THE THREE KINGS HAVE GOT THEM………THEIR FAVOURITE TOYS OR BLACK COAL………FOR NOT BEING TOO GOOD……. SORRY about my long comment and the capital letters I just forgot. I have my copy of this magazine in front of me and this is a beautiful quilt! 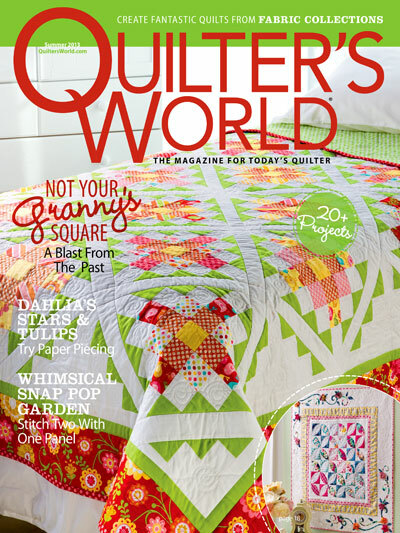 I’m so happy for you and you deserve to be on the cover of all quilt magazines out there! Your work is just so amazing!! Thanks to all of you who responded to the words of faith. I, too, love the Wise Men story, and have a wall hanging with tons of pieces and applique, entitled: “How far to Bethlehem?” from the Adoration book. It’s SO inspiring. 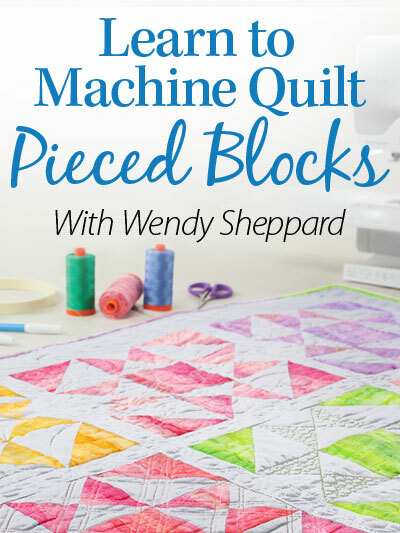 Love this quilt and have the book, and intend to make this quilt some time. I haven’t seen all of the fabrics, just one or two out there now. Hopefully, the star fabrics will come out eventually. Blessings on everyone’s Christmas. Oh my gosh! That’s just beeeeeyooootiful! Your piecing, as always, is fantastic, and then you go & put those gorgeous quilting stitches in – what imagination & vision you have! I’m sure it was a shoo-in for the cover – it’s gotta be hard to top that beauty!! Glad your holiday went so well!! You deserve a rest now, for sure! Your quilting is stellar. The contrast is also wonderful. 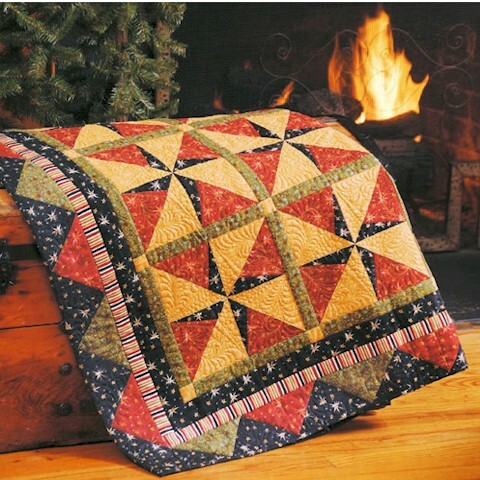 This is absolutely beautiful….there a lots of very nice quilts entered. but boy will be hard to beat this….The quilting is spectacular..
Congratulations and much love to you from all of us here at your Bernina “alma mater” Rogers Sewing Center!! We are so proud of you!! I loved this when you showed us a sneak peak. I’m so glad you made the cover. Your work makes my heart skip a beat! Just beautiful! 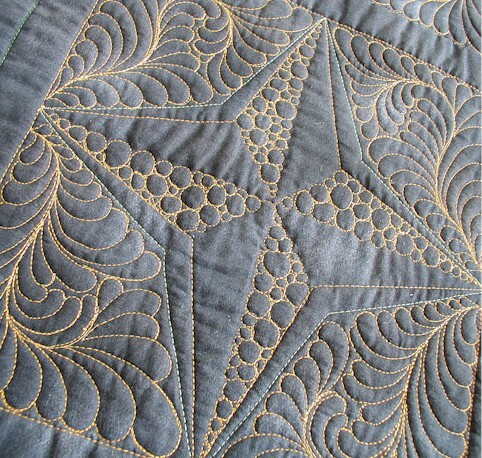 It certainly is a ‘starry’ quilt and just shimmers with the quilting. I am constantly blown away by your beautiful quilting. 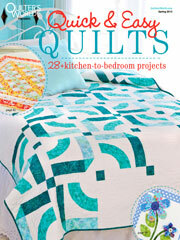 It is a gorgeous quilt and looks wonderful on the magazine cover. Congratulations! What a beautiful quilt. 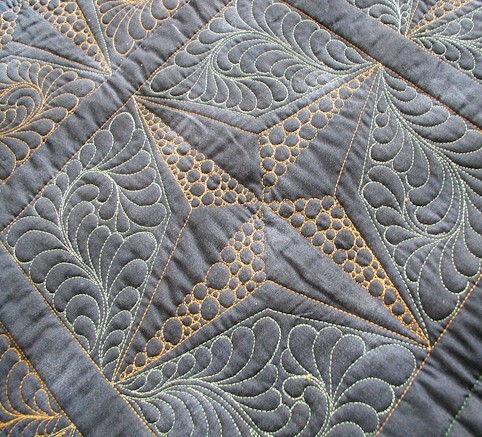 The quilting is gorgeous, as is the design. I have almost worn out my copy of that magazine looking at this quilt. And thank you so much for sharing your inspiration for the name. I saw your beautiful Starry Pursuit quilt in person in Des Moines recently and also bought the Easy Quilts magazine with it on the cover. I love it! Your work is elegant and inspiring! You so wonderfully take to heart the instruction, “Whatever your hand finds to do, do it with all your might” Ecclesiastes 9:10. You’re amazing in all you accomplish! great quilt and the quilting is amazing as always! i love the idea of taking an old pattern and giving it a new twist! This quilt is really awesome and I love the story behind making it a naming it! You have a wonderful sense of colors and your quilting was wonderful! The back of the quilt was just as wonderful as the front! Thank you so much for sharing with us and have a wonderful “Merry Christmas”. This is the reason for this season, Jesus Christ! Wish I could have gotten the magazine but couldn’t find hard copy so I ordered download but was never able to open it and in the end I cancelled the order. Oh well, I have enough to make without it. What a beautiful quilt and I just love your quilting! that is the way holidays go sometimes. too fast. great entry for the quilt show. I love the story behind the inspiration for your quilt. 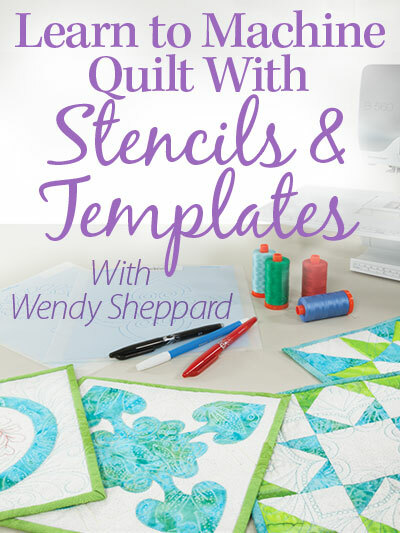 Wow – your free motion quilting on that is stunning! I love the pattern it makes on the back of the blocks. Congratulations Wendy, you are one talented lady. What excitement for your sister to be able to see your quilt published. I sure wish you lived beside me. That is such a beautiful quilt. Good job! Wendy, I love everything about this quilt. The pattern, the fabric, the quilting……. beautifully done. What a stunning display of quilting. Beautiful quilt. 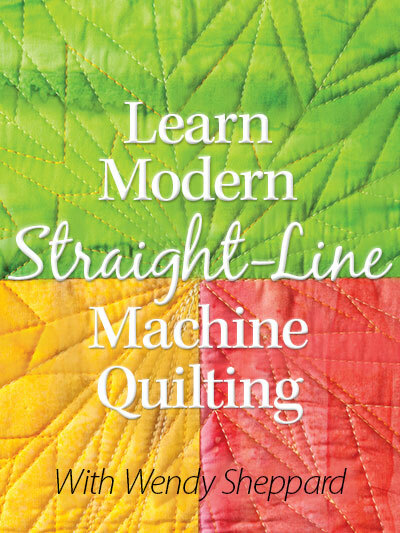 My Christmas wish would be to be able to machine quilt like that! Bless you. I love the colours in this – all soft and muted. Congratulations! What a beautiful quilt, and the quilting is amazing. Wow, the quilting is stunning! Def worth the wait! Love it! What a beautiful quilt Wendy!! 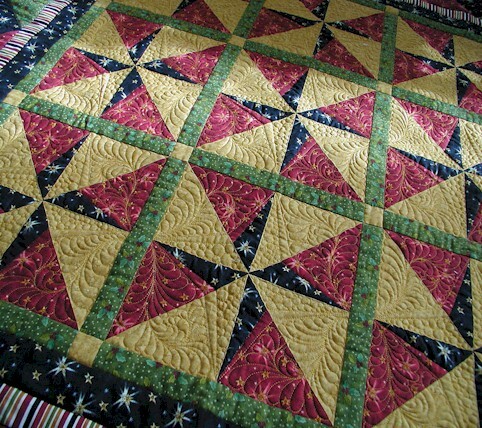 The quilting is gorgeous, as is the design! Congrats because you made always big success! 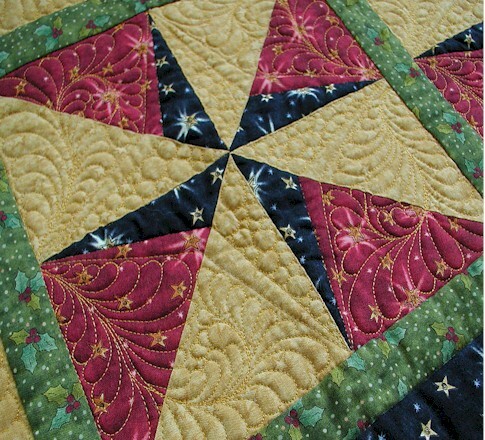 I love the way you have customised the quilting to emphasis the stars. The effect is stunning. Congratulations on being a cover girl. Beautiful work. Just awesome and wonderful. I love your story to go along with it. And when we set up our Nativity set this year, I will be sure to tell my children and grandchildren this verse and the reason one of the wise men is kneeling. 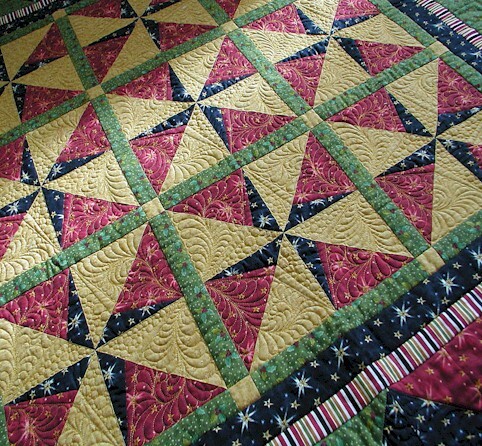 Very lovely and fabulous quilting! Congratulations on being on the cover. 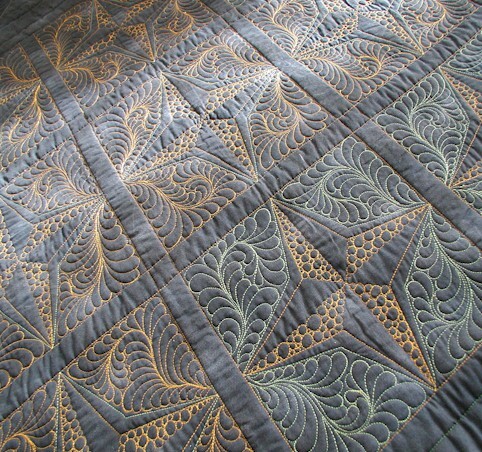 My goodness that beautiful feather free hand quilting. How is it possible that you did this on your sewing machine. Where did you learn this. STUNNING!!!!! I have that Magazine. Congrats on the Cover! So fun that your sister loves your quilts too! Very nice and what beautiful quilting. Beautiful quilt! Thanks so much for sharing it!! Wow – the stitching on this quilt is just beautiful. I love it! oh, that is definitely, absolutely cover-worthy. is that quilting hand done? if so, it went from being fantastic to being an heirloom. Oh, I love it! I love pinwheels so this version is just incredible. I think I may have to try to find that magazine. Thank you for sharing. I love the fabric choices, and of course the quilting is exceptional. I’ll have to go back and look for my copy of the mag, now that I ‘know’ who made it – congrats! Wendy, since imitation is the sincerest form of flattery, I’m trying desperately to copy your Starry Pursuit quilting on my long arm. Mine is definitely a poor forgery. I got my long arm in December so have a long way to go to refine my skills. I’ll keep at it–you’re quite an inspiration indeed!